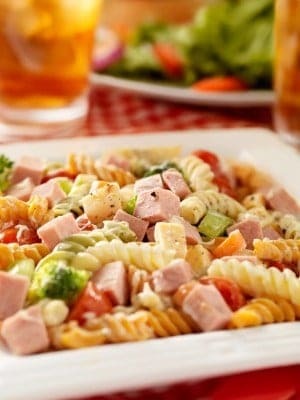 Barbara's Pasta Salad features chicken breasts, artichoke hearts, broccoli, and so much more. Cook the chicken and pasta until done. Set aside to cool. Prepare all of the veggies, clean and chop in bite size pieces. Chop the cooled chicken into small cubes. 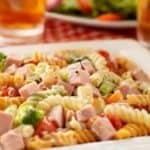 Toss all of the chopped veggies, pasta and chicken together then add the entire bottle of Wishbone's Robust Italian dressing, toss again and serve. This will keep up the three days in the fridge covered. This salad can feed up to 6 people as a main dish or 10 people as a side dish.